SINGAPORE - When pharmaceutical company GlaxoSmithKline (GSK) first started its factories here over three decades ago, there were no locals with the skills and expertise needed to manage its sites. It had to rely on foreign employees to complement the local workforce, but recruited and trained locals to take on those roles. Today, about nine in 10, or 500, of the company's workers here are local, and the local scientists will be helping to transfer technology piloted here to units in the United Kingdom. GSK was among 74 companies to receive the new Human Capital Partner mark at an event on Friday (Feb 17). The scheme, announced in November last year, recognises progressive employers who develop staff. They are rewarded with benefits such as being put on the fast track when applying to the Ministry of Manpower for foreign worker passes and grants, and a dedicated hot line to reach the ministry instead of having to go through the general call centre. Companies that come on board need to commit to three priorities: build a stronger Singaporean core by investing in employees of all ages and at all levels; select foreigners that complement local workers and not substitute them; and proactively transfer expertise from foreign professionals, managers, executives and technicians to locals. 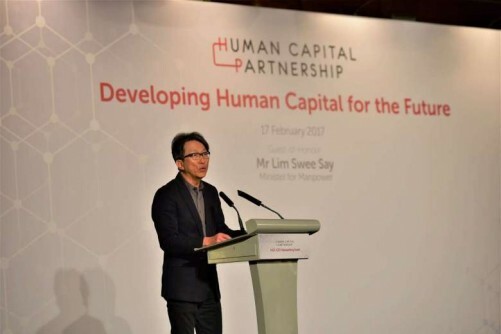 Manpower Minister Lim Swee Say said that good human capital management is important because while growth in the future economy must be driven by pervasive innovation, the future workforce must also be more inclusive. "On our journey towards the future economy, we will, of course, continue to act on unlawful and unfair practices. But more importantly, we want to do much more to speed up the adoption of not just fair, but progressive practices across all sectors and all sizes of enterprises," he said, speaking to over 160 company representatives at Raffles City Convention Centre. He added that as global competition for better investments and jobs grows, Singapore will need to develop new and emerging capabilities in the local workforce and at the same time draw on external expertise. This expertise should be transferred to locals, who can be nurtured to take on global roles. The HCP programme is put together by the Manpower Ministry, Tafep, the National Trades Union Congress and the Singapore National Employers Federation. Other benefits for companies in the scheme are working with the ministry to pilot new employment and employability programmes, and getting advice from the Tripartite Alliance for Fair and Progressive Employment Practices (Tafep) on available grants and schemes.